TNT Performance Products has a reputation for making the lightest, bar none in durable replacement parts. Their front hub is as light as they come and basic in design. The hub flanges are machined from 7075-T6 aluminum rod stock, with a hole drilled through for the axle, and a second larger boring to make a seat to recess the precision sealed bearing cartridge.. Between each of the hub flanges is a Titanium tube, having a 22.25mm outer diameter. The flanges are pressed into the Ti tubing hub core, and the Japanese KSK 9R-6 bearing cartridges are pressed into each flange. The axle is machined from Ti 6Al-4V rod then pressed into and through the bearings. The final part of the hub is the locknuts which are machined from aluminum rod. There is one locknut on each side, with 14mm wide flats for a thin cone wrench to grip. Threadlock is used to assist in holding the locknuts in place, though its not necessary. You will two 14mm cone wrenches capable of fitting in the 2.5mm space on each locknut. Each locknut has a 19mm diameter, smooth outer face. 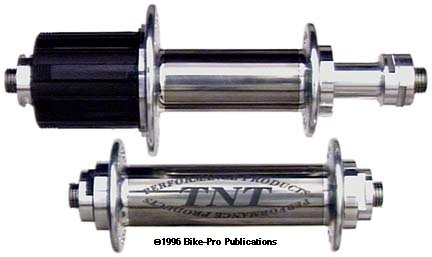 The TNT Ti front has a 40.5mm hub flange diameter, with flanges spaced 75mm apart. The spoke holes have a 32mm center circle diameter. It is available in either a 28, 32 or 36 spoke hole drilling. The flanges and locknuts are Silver, the hub core tube is Ti Grey. The weight of a 32 hole Ti front is just 83.5 grams. TNT make an oversized version of their front hub for arduous mountain bike riders. The flanges are made the same as the above hub but larger in diameter, which also seat a larger bearing. The Titanium tube is 31.75mm in outer diameter. This larger tube is pressed and bonded between the flanges. The axle is made in two pieces, with a 25mm outer diameter. Each half of the oversized axle has its interior machined away to reduce weight and the two parts lock together to turn as a single piece. With one bearing installed, the axle is set within the hub shell, then the second bearing is pressed in place. Locktite (640) is used to make a final seal of the bearing to the flange should there be the slightest gap left. The exposed axle leaves a 20mm diameter, with a smooth contact surface. The axle ends are 9mm in diameter with a threaded hole, so the wheel can bolted on, or a skewer may be used, (neither bolt or skewer is included). To take this hub apart will require driving a rod through the axle, to deliver a firm rap on the inside of the far axle half. This will knock out the bearing on the far side by using the 20 up to 25mm shoulder to drive the bearing out, freeing the axle. The TNT Suspension front has a 50.7mm hub flange diameter, with flanges spaced 76mm apart. The TNT Suspension spoke holes have a 42mm center circle diameter. It is available in either a 28, 32 or 36 spoke hole drilling. The flanges and axle are Silver, the hub core tube is Ti Grey. The weight of a 32 hole Ti Suspension front is just 145 grams. The TNT Ti rear hub is an 8 model using the Shimano Ultegra freehub body. The Ultegra freehub was chosen because it will accommodate the proper length and spacing for 8 speed gearing while being the lighter among choices. The flanges are machined from 7075-T6 aluminum rod stock, in fact the non-drive flange is the same used on the standard Ti front. TNT has a machined aluminum bearing carrier which the drive side bearing is pressed into from the outer side. This bearing carrier also very cleverly incorporates the thread-in bolt that fastens the freehub body to the hub shell. The hollow Titanium axle is supported by the bearings at each end and the freehub. This hub can be fit with a 130mm (Road riding use) or a 135mm (Mountain bike use) over lock nut dimensioned axle and accomplish 8 speed gearing. Aluminum thread-on spacers determine how the hub is centered and amount of axle exposed on each side. These machined spacers have 2.5mm high flat grips for a thin cone wrench. A single one is used on the drive side and two are used on the non-drive side, which tighten against each other after the inner spacer is cinched against the drive side spacer. The 135mm, 8 speed will accept CS- M737, HG-90, or HG-70 8 speed cassettes. For 7 speed, the HG-50, HG-60 or HG-90 cassette sets will work. The Ti Freehub rear has a 40.6mm hub flange diameter on the non-drive side, and a 54mm diameter on the drive side. The flanges are spaced 55mm apart. The TNT Ti Freehub spoke holes have a 32mm center circle diameter on the non-drive side and 46mm on the drive side. The Ti Freehub rear is available in a 28, 32 or 36 spoke hole drilling. The flanges and spacers are Silver, the hub core tube is Ti Grey. The weight of a 32 hole Ti 8 speed rear is just 246 grams.